Newborn Photo Album. 20 page lustre photo paper with Gorgeous Photo Suede Cover. Imagine, your baby is now 10 years old. She is fascinated by stories of when she was a baby. On her birthday, you enjoy a yearly ritual- sitting next to her on the couch, flipping through her baby album. The silky smooth photo cover, and thick photo pages bring back many memories, as you reminisce and think about how quickly time has passed. Imagine, your baby is now 30 years old. He has just become a father and like many new grandparents, you bring out all that you have kept from when your child was a baby. The heirloom is now passed on to your son, who will compare his features in his newborn pictures to those of his new baby. He may even enjoy looking at it with his own children as they grow. There is something special about holding a collection of images in your hand, enjoying them snuggled next to one of your favourite people. I truly believe that the emotions created while doing this cannot be replicated by flipping through an album on facebook. Printed photographs are so important to your family legacy; of ensuring that the memories are there to be passed on to the next generation. At Kelly Rawlinson Creative Photography, the albums we choose to carry will stand the test of time. The hand-made covers can be finished with a photograph, or a high quality selection of fabrics- vintage linens, silks, leatherette and genuine leathers. It can be personalized with a printed or embossed name or birth date. The lay flat pages are true professional photographic paper mounted on a thick core, resulting in beautiful, durable album. 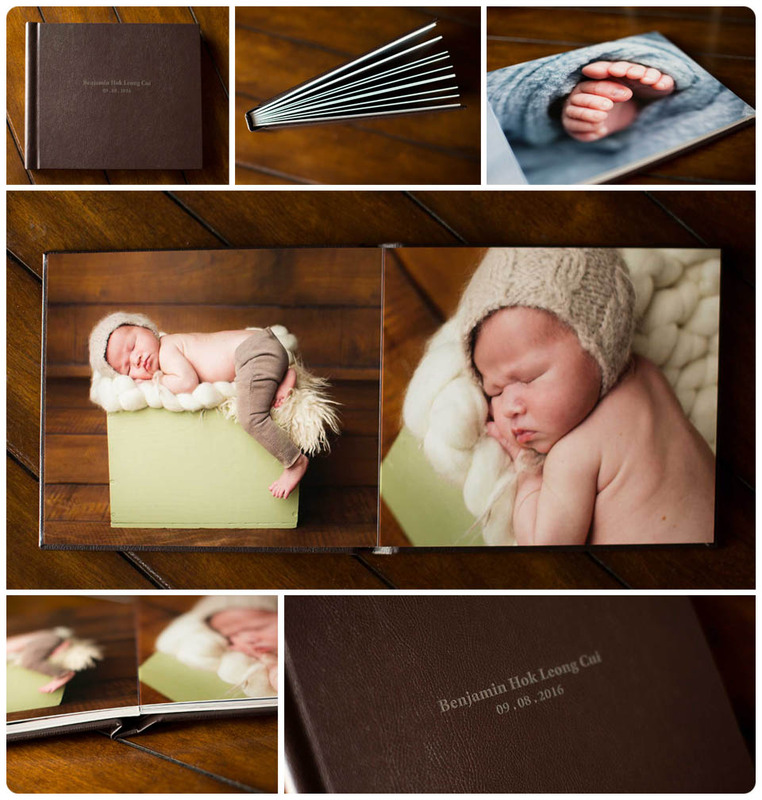 Baby albums are custom designed by Kelly, fit to suit your vision and style. 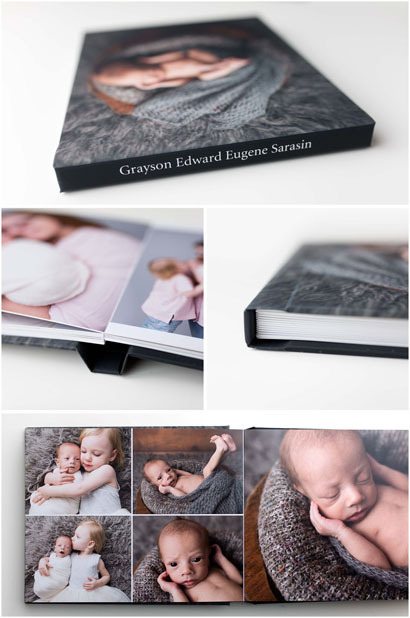 Custom Baby Album featuring brown leatherette cover with embossing on front. Expecting a baby? Call (905) 967-3103 or email info@kellyrawlinsonphotography.com to get more information about KRCP newborn photography services and heirloom product line.